As you learned way back in Step 1, the solar industry is driven by the STC scheme, which everyone but the government and the regulators calls the solar rebate. The rebate covers almost half the price you pay for solar, and the government uses it as a way to regulate the industry. In a nutshell, if you want to claim the rebate, you have to follow some extra rules and regulations when installing a solar system. You have to use approved inverters, approved panels and an approved installer. The panels, inverters and installers are approved by a non-profit called the Clean Energy Council. All solar companies that sell grid-connect solar systems must use approved hardware. They must also use accredited designers to design the system. To install the system, they must use licensed electricians who have a further qualification that classes them as a Clean Energy Council Accredited Installer. Key point: The Clean Energy Council only accredits people, not companies. Some solar installation companies claim to be Clean Energy Council-accredited. This is not true. The Clean Energy Council only accredits individual electricians. By law, companies need to use those accredited electricians to install residential solar power under the solar rebate (STC) scheme. While a company can’t be accredited by the Clean Energy Council, it can be a member of the organisation. Unfortunately, being a member isn’t a watertight indicator that a company is reputable. The Clean Energy Council survives on subscription fees, so most companies that apply to be a member will be approved – unless they’ve done something really bad. Scrolling through their member list as research for this book revealed a couple of companies that I wouldn’t recommend to anyone. However, the Clean Energy Council does have a scheme that has a high bar to entry and excellent compliance checks: the Approved Solar Retailer Scheme. 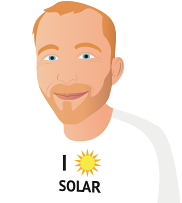 If you’re looking to engage an installer and they’re an Approved Solar Retailer (again – don’t confuse this with a ‘member’ or an ‘installer’), they’re almost certainly a reputable company. Does that mean the solution is to get a quote from the nearest Clean Energy Council-Approved Solar Retailer? If you have one of these companies locally then I would absolutely recommend getting a quote from them. You can find an up-to-date list of every approved retailer here: solarquotes.com.au/asr. If you can find three solar companies using the link above who can install locally, getting a quote from each of them will give you a choice of quality systems backed by reputable installers. However at the time of writing, there are only 54 Clean Energy Council-approved solar retailers across the entire country. There are thousands of companies selling solar power systems that are not Clean Energy Council-Approved Solar Retailers, including dozens that I know to be absolutely excellent operators. The downside of limiting yourself to Clean Energy Council Approved Solar Retailers is that with a little over 2% of solar companies enrolled, the chances are that you’ll be excluding many of your local solar companies and you’ll have to go further afield for quotes. The price you’ll pay may be a little higher, and the choice of hardware is likely to be narrower, than it could be if you used a well-regarded local. Why aren’t more solar companies enrolled in the Clean Energy Council Approved Solar Retailer scheme? The cost. Depending on the size of the company, being a Clean Energy Council-Approved Solar Retailer costs $800 to $6,000 a year in fees – plus higher overheads due to a strict compliance requirement for procedures and policies. Its requirements favour medium to large organisations. Small installers have told me they don’t feel the scheme is suited to small installers with very low overheads who value autonomy and dislike bureaucracy. Approval is a high bar. It takes a big effort to comply and stay compliant. Small solar companies don’t have a whole lot of time or resources to deal with this stuff. Politics. Without getting into the politics of the Australian solar industry, many solar companies are wary of the Clean Energy Council and disagree with some of their procedures and policies. I like most of what the council does, but I respect solar installers’ grievances. If you have a complaint about an approved retailer, the Clean energy Council will investigate. They’ll kick the company out of the scheme if they’ve breached the code of conduct, but they won’t help you resolve your particular issue. They’ll simply direct you to your local consumer tribunal. Being an Approved Solar Retailer isn’t a guarantee of the company’s financial stability. Two approved companies have gone broke. As I mentioned in Step 5, though, it’s impossible to guarantee a company won’t go broke, especially in the low-margin, high-cash-flow solar installation business. The Smart Energy Council15 is a more ‘grassroots’ version of the Clean Energy Council. Its fees are lower, and its members tend to represent the ‘small end of town’ better. They have a Master Installer Scheme, where installers can pay a fee, do some extra training and use the moniker ‘Master Installer’. At the time of writing, about 130 installers are signed up, but the scheme is less transparent than that of the Clean Energy Council about how installers qualify. From what I’ve seen, the bar is quite low compared with the Clean Energy Council scheme. If you can’t find three local Clean Energy Council-Approved Solar Retailers for your quotes, it’s certainly better to look for local Smart Energy Council Master Installers than to do a Google search. An installer who makes the effort to become a Master Installer has shown some commitment to the industry. 15Called the Australian Solar Council until late 2017.